Wood end cap for Select Wood 1 3/8" diameter wooden curtain rods. 7/8" L x 1 7/8" H.
Draperies rods at BasicQ. One way left, includes 4 support brackets and 33 slides for attaching your draperies. Curtain rod hardware for the budget minded. Empire Traverse Rods are made from heavy guage steel with a baked enamel finish. Quick mounting drop in brackets and supports that fit over rod are included. Cord guide is included to hold cord to wall. The Empire rod has self lubricating pulleys and slides.Polyester cor and continuous lacing for use at either end or to convert to one way draw. Sixteen foot reeded wooden curtain rod , 2 1/4" in diameter. Base price for unfinished, colors are more. See matching Finials, Brackets and Rings Truck shipping only. 1 1/2 elegance 2 decorative cafe rods 28-48"
Brass curtain rod finish. Rods are metal, finials are plastic. Projects 3 1/2 to 4 1/2 inches. Clearance 2 1/2 to 3 1/2 inches. Installing curtain rods is easy! Drapery hardware collection by Graber. Not a drapery hardware knock off, by Graber, a name you can trust for quality. Adjustable curtain rod from 28 to 48 inches. 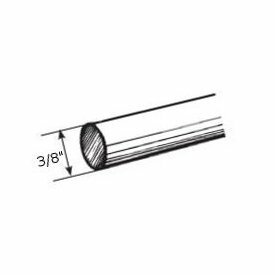 2-424-8: 1 1/2" Elegance II decorative cafe rods 84-156"
Clearance 3 1/2" to 5". 2 1/2" wide. Convert 4 1/2" dauphine curtain rods to use in bay windows or as corner curtain rod. by Graber (for 4 1/2" rod) White finish. 9-401-1: Reversible elbow projects 1 3/4-2 3/4"
2 inch double bracket for Wood Trends Classic wood poles. 8" from front to back, 4 3/4" high base, 1" thick. For wood pole in front and utility curtain rod in back. Available in seven colors. Made by Kirsch, a quality company. Double rod drapery hardware. This bamboo 2" curtain rod ring measures 4 inches in diameter. Sold by the set, 4 rings per set. Made of resin.